Hello my friends, today starts a new challenge at Paradise of Magnolia so come on over and join us!! This is my DT creation, hope you like it! For my card I chose to use one of the new images from the "Pink Lemonade 2014" collection "Tilda with rose lace dress". Isn't she adorable? It's a flip-its card . 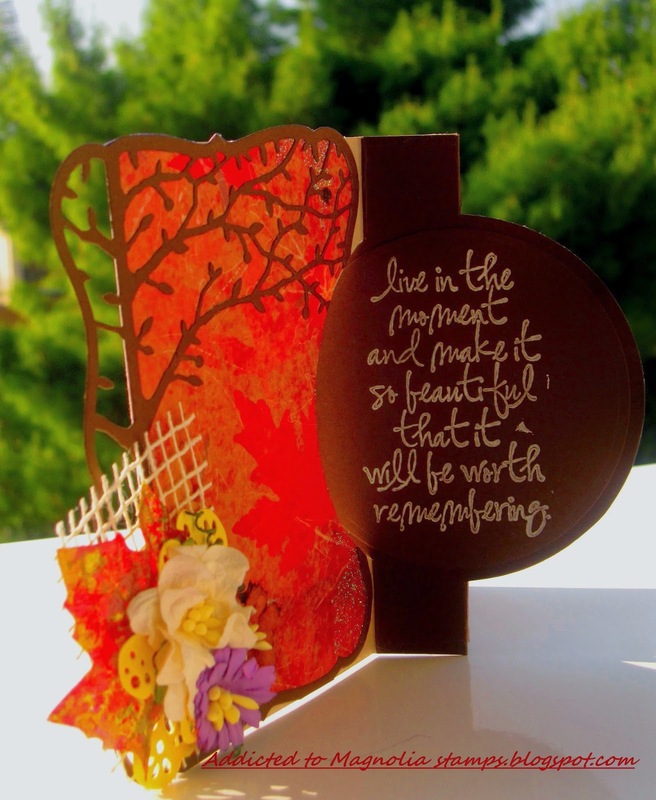 I used papers with autumn colors and paint my Tilda with Distress inks. Thanks for stopping by and visiting, be sure to come on over to Paradise of Magnolia challenge blog and check out the lovely DT creations. We love to see what you create <3 !! The design and the colors are perfect. Gorgeous card and loving the beautiful image and design. I am your newest follower. You have a beautiful blog. Hello there Panagiota...thank you for your lovely comment on my blog AND for becoming a follower!!! It's always fun to share our love for our sweet Tildas with others...I took a scroll through your wonderful blog!! I'm loving your creativity!!!! I love the colours and folds on this BEAUTY...of course your Tilda is the highlight!!! This is a beautiful card with gorgeous autumnal colours. Thank you for joining us at Marvelous Magnolia, good luck and I hope you will join us in our next challenge. Gorgeous!! Love the colors!! Just absolutely beautiful!! super cute Tilda card! Thanks so much for joining us at Tilda's Town this week! What a super card. Love the colours and Tilda is so sweet. Thanks for joining us at LHOSM.